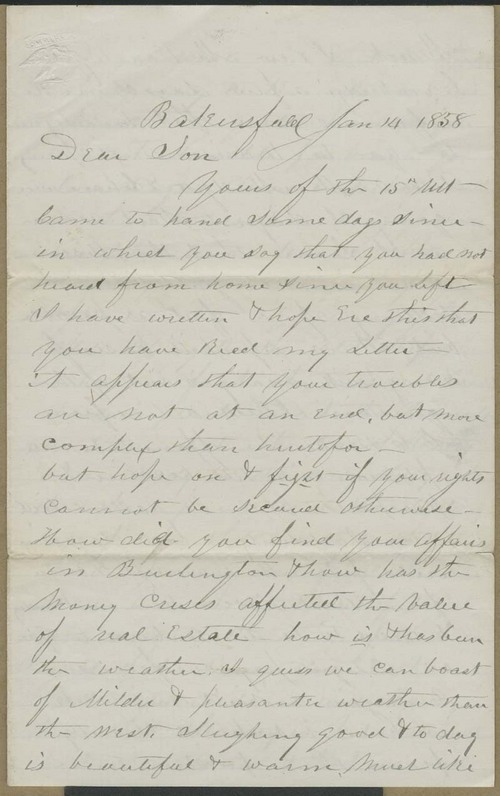 Writing from Bakersfield, Vermont, to his son Oscar Learnard, S. T. Learnard claimed he was still planning to travel to Kansas Territory, and he asked about his son's affairs in Burlington. Learnard also focused on political attitudes in the East and mentioned Stephen Douglas' "speech on Kansas affairs" (Lecompton Constitution), which had caused "our Bogus democrats" to draw in "their horns." Many Democrats, he insisted, were still "ready to do any dirty work the slave power wish them to do."